Squats and Lunges Hurt My Knees HELP! Oh and step up too! I get that a lot :) so we can work around it no problem! If it hurts- STOP. But grinding, pressure, crackles, and pops are all okay if they do not hurt. If it hurts, substitute another similar exercise. Always try the exercise that is called for in the workout, even if it hurt last time. There is a significant chance that at some point, the knee (or other joint/muscle) will one day no longer hurt. Just because squats hurt your knees now does not mean that they always will. The great thing about strength training is that they will get stronger and the pain will lessen over time. Generally speaking, most find a wider stand more comfortable. I know I do. It takes a lot of pressure off the knees. You can also put plates under your heels to see if that helps as well. If it hurts- STOP. Do deadlifts instead of squats for the rest of the reps. You can also sub bulgarian split squats too if needed or if they feel better. Add weights to make squats more challenging, go lower too. The height of the step determines the intensity. The lower the step, the less intense. Anything above the floor plane is technically a step up. So play with it and see what height feels best. You might be surprised that a specific height is pain free. Do not bound off your back foot. The foot stepping up should do all the work. If it hurts- STOP. Sub lunges or reverse lunges instead. Add weights to make it more challenging and/or increase the step height. Step back or forward enough that your front knee is at a 90 degree square angle from the floor at the bottom of the lunge. You do not want that front knee to go past your toe. You might be surprised that either a forward lunge or reverse lunge is pain free. You can stick to either one. If it hurts- STOP. Sub step ups or Bulgarian split squats instead. Add weights to make it more challenging. Most recent physio recommendations are to NOT stretch before lifting. Your muscles are cold and tight. The best warm up is about 5 minutes of cardio: walking on a treadmill, elliptical, or a bike. Most of the time I do not warm up. I just do not go out for a maximum lift first thing. 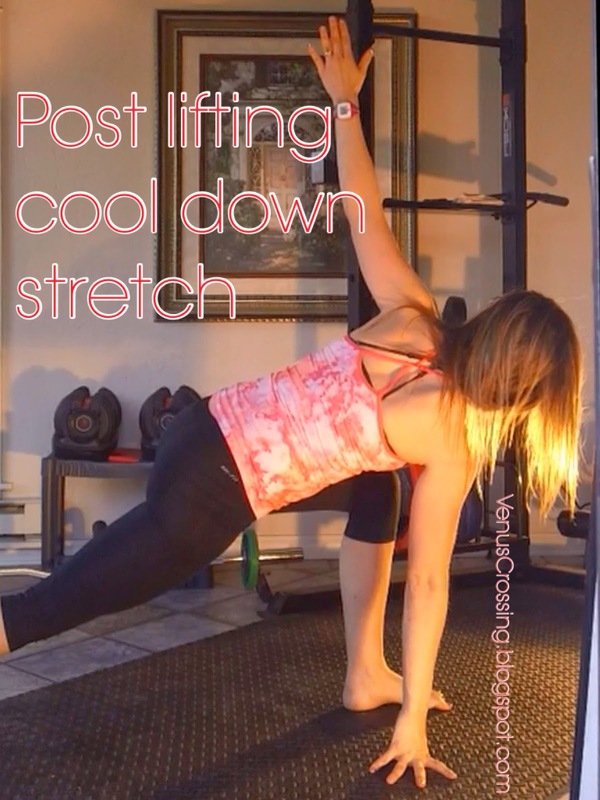 After a lifting session, I like to stretch my whole body to cool down. I find that it helps relieve some of the DOMS (delayed onset muscle soreness). This is my normal stretching routine in the video below. I hold most of them for 5 seconds or so. If a muscle group is extra tight, I go back again and repeat the stretch in that area.